Start off your visit on the 11th (Sat): stroll through Gun Hill. To see where to stay, maps, ratings, and other tourist information, read Mussoorie driving holiday planning website . Bengaluru to Mussoorie is an approximately 6-hour flight. You can also do a combination of flight and taxi; or drive. Finish your sightseeing early on the 12th (Sun) so you can drive to Rishikesh. Get outdoors at River Rafting & Tubing and Kayaking & Canoeing. Venture out of the city with trips to Haridwar (Har ki Pauri & Ganga Aarti at Haridwar). There's lots more to do: snap pictures at Lakshman Jhula, contemplate in the serene atmosphere at Triveni Ghat, and indulge in some personalized pampering at some of the best spas. To find other places to visit, ratings, more things to do, and more tourist information, read our Rishikesh holiday builder . You can drive from Mussoorie to Rishikesh in 1.5 hours. Another option is to do a combination of taxi and bus. 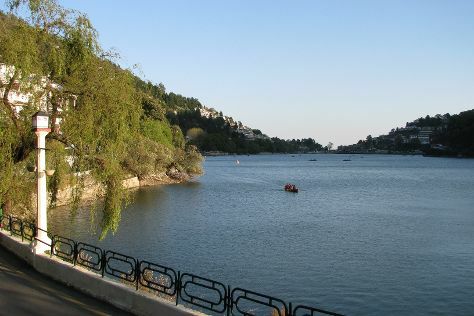 Wrap up your sightseeing on the 15th (Wed) early enough to drive to Nainital. Kick off your visit on the 16th (Thu): get to know the resident critters at High Altitude Zoo, then make a trip to Naina Devi Temple, then contemplate in the serene atmosphere at Goddess Naina Devi, and finally explore the activities along Nainital Lake. On the next day, take in nature's colorful creations at Eco Cave Gardens and then take in the awesome beauty at Naina Peak. To see maps, other places to visit, more things to do, and tourist information, you can read our Nainital tour itinerary tool . You can drive from Rishikesh to Nainital in 5 hours. Alternatively, you can do a combination of bus, train, and taxi; or take a bus. Finish up your sightseeing early on the 17th (Fri) so you can travel back home.